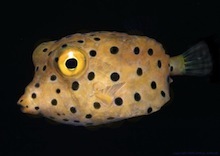 Enter, the boxfish (Ostraciidae). 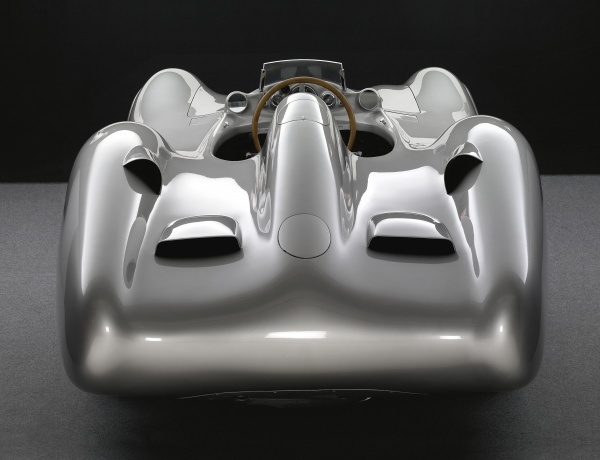 Turns out that all those swoopy, pointy, wedge, edgy car shapes have nothing on this fellow in terms of aerodynamic efficiency—and Mercedes Benz, which not only employs aerodynamicists but bionic scientists, based a “sensational prototype” on it. That was 2006 but that car has still not spawned a new design direction, largely because nothing in the compromise-riddled world of vehicle design is simple. In fact, the author also discusses the boxy 1981 Audi 100 whose unintuitive shape was then considered to possess the lowest drag coefficient of any mass-produced car in the world. The author, conveniently, is a biologist and also studied physics, chemistry, philosophy, and linguistics before becoming an editor at several German car magazines covering both contemporary and classic cars. This book draws on all these skills. 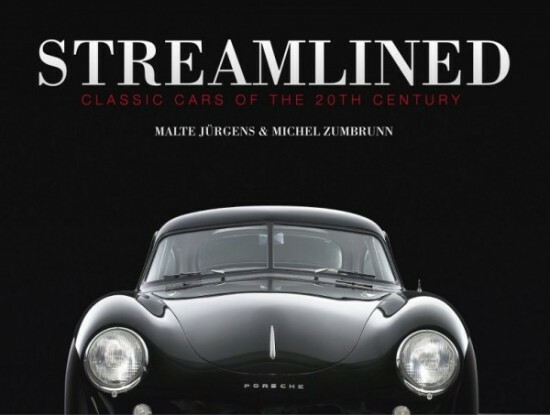 The competent writing (which has lost some of its sparkle in the translation) is superbly accompanied by photos of Swiss car photographer Michel Zumbrunn. Many of the book’s pages are printed on black background so shallow breathing and dry hands are essential for keeping it free of smudges. 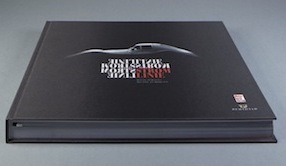 The reason this book started life as a German project (Stromlinie, ISBN 978-3613031227) is that it centers on cars gathered for a display at the most excellent private Prototyp car museum in Hamburg, Germany in 2009. 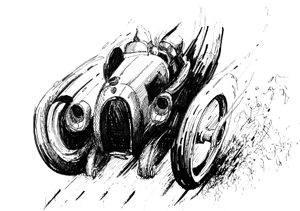 The reason it was such a lavish, and expensive, production is that one of the masterminds behind it is Paul Pietsch, an Auto Union racing driver (his 1952 Avus Coupe is included here) who went on to found Das Auto magazine and then the Motorbuch publishing house, now run by his daughter, that published this book. It is slightly larger, has a few more bells and whistles, was limited to 999 copies, but will set you back a cool €298 ($325)! So, hats off to US publisher Schiffer for once again recognizing a great book, producing it in English, and making it eminently affordable to boot. The 2009 show at the Prototyp musem actually consisted of two related events a few months apart, first the “STROMLINIE, 100 Years Against The Wind” exhibit and then 100 YEARS OF FUTURISM AND AUTOMOBILE. Each featured exhibits not often found under one roof and thus this book’s claim to being an “unparalleled artistic documentation” is not entirely unfounded. The museum’s concept, incidentally, is a three-pronged approach to creating context: people, [motive] power, and cars. 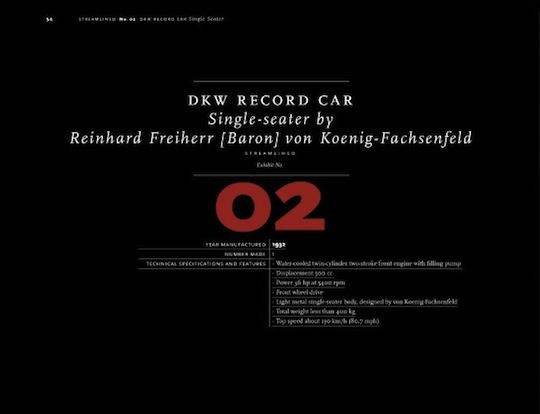 In German, the corresponding words Personen, Kraft, Wagen neatly play on the abbreviation PKW which stands for passenger car. People who like typography and book design will find much to praise here (well, except for the photo captions in torturous 6 pt italic). The landscape format is ideal for car photography and there are quite a few cases of photos going over the entire spread. 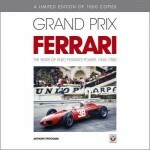 The 25 cars from 1922–1978 are shown at the beginning of the book in the form of a timeline that also doubles as the Table of Contents. An almost 20-page-long introduction to streamlining dispenses the pertinent science and history in lay terms and Jürgens makes an effort to insist that serious thinking in this area predates the World War I era, something often misstated. Since he purposely refrains from all-out tech speak and formulae it is all the more important that the meaning of his elaborate and polished writing not be obscured by a translation that doesn’t quite manage to free itself from the intricacies of the writer’s native tongue. The English reader may well have to read a sentence several times to fully decode a thought. Each car is treated to an 8–15-page discussion, beginning with a table of basic stats (year, quantity, survivors, specs and features) and then flowing into pages of lavish photos accompanied by more text and thorough photo captions. Except for the introductory material there are no period photos. US readers should note that all the cars here are European, mostly German. The German version won the 2012 ADAC Motorwelt Autobuch Preis. Price isn’t everything, but the low cost makes this book an extraordinary value.